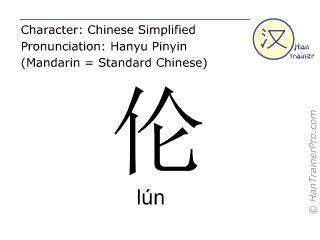 You cannot listen to the pronunciation of lun because your browser does not support the audio element. human relations, order"Why are some translations grayed out?" Chinese character and stroke order animation"How do I write 伦 ( lún ) correctly?" 伦 is composed of 6 strokes and therefore is of low complexity compared to the other simplified Chinese characters (average: 13.1 strokes).